It's another week of winter and snow here in Bergen. We're sure to make the best out of the weather today, and headed out to Myrdalsvannet with Luna and Sebastian. We haven't been to the lake for quite a while, so Luna was really happy to see the place again. She wouldn't stop walking around and exercise her nose. All Sebastian wanted to do was to play around in the snow. This gave dad a chance to take a few pictures. I feel I'm getting rusty with the camera, as I have so much else to do right now. 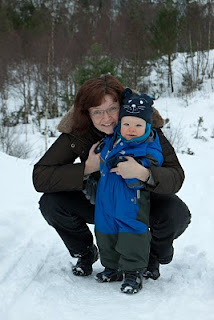 But I managed to take a few good shots of Sebastian and mommy. There are a few more pictures in the album over at photos.rundtomrundt.com.